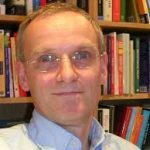 Reader in Contemporary British History, University of Bristol and lead – Thatcher’s Pension Reforms project. The most dull and predictable general election in modern British history has its interesting aspects. First, it may mark a turning point in the major parties’ ideological stances. Second, it may mark a return to two-party politics (with polls indicating around 4 in 5 votes will go to one of the two main political ). In the arena of pensions policy, Labour offers much more to voters than do the Conservatives. 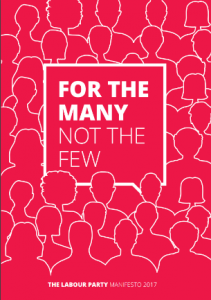 Labour’s manifesto is its longest ever, packed with policy proposals and spending promises – not least on pensions – to be funded by higher taxes on the better off and on companies in a faster growing economy. In many respects the manifesto reflects the present uneasy compromise between the party’s Left and ‘moderate’ wings – combining promises that might have appeared in the 2010 manifesto with arresting new policies, most notably major state investment in economic modernisation and renationalisation. In pensions policy, Labour makes several promises. First, it guarantees the present pensions ‘triple lock’ throughout the next Parliament: meaning that the state pension will rise annually by the higher of that year’s price inflation, increase in average earnings, or 2.5%. There is also a promise to maintain the winter fuel allowance and free buses for all pensioners. More vaguely, state pensioners living overseas will protected (though it’s not clear what this means). There is a clear statement that ‘over 2.5 million women born in the 1950s have had their state pension age changed without fair notification’. (A claim contested by some commentators, including me). But Labour’s promise of ‘some kind of compensation’ is vague –the accompanying costings document suggests it amounts to no more than the party’s current policy of limited means-tested assistance. Labour’s most arresting promise is its rejection of the planned rise in the state pension age above 66 between 2026-46. Here Labour implicitly acknowledges a truth – that those rises are deeply unpopular, and probably unrealistic for the many people who have been working flat-out since they left school at 16. Yet, abolishing those planned rises in state pension age is potentially a very expensive long-term commitment (and notably absent from Labours’ manifesto costings). Steve Webb, a former Lib Dem coalition minister for pensions, has estimated that over the next 18 years this will cost an ‘eyewatering’ £300bn at today’s prices. Webb is no friend to Labour, it is true, but his estimate does not seem unreasonable. Yet, the real cost would actually be higher. Abolishing the planned SPA rises doesn’t just mean pensions being paid earlier, it also means a loss of tax and national insurance contributions from those retiring sooner than expected, not to mention value added lost by their absence from the workforce. Unless Labour’s economic strategy delivered a step-change in the UK’s future projected growth, the cost of this promise would represent a significant burden on the younger generation unless new ways of raising tax revenues could be found. Despite big claims for its interventionist economic strategy, the Conservative pitch to the electorate is implicitly downbeat about the possibility of better economic growth in the future. The party has a continuing (if further deferred) commitment to deficit elimination. So the manifesto is notably short on ‘goodies’ and embodies some significant public spending cuts (e.g. to in-work benefits). There is certainly very little in the Conservatives’ manifesto relating to pensions. They do make a firm promise to ditch the ‘triple lock’ after 2020, replacing it with a ‘double lock’ based on the greater of the annual rise in earnings or in consumer prices. They propose to expand additional pension provision by widening auto-enrolment into the National Employment Savings Trust (NEST), a default workplace pension scheme that is in the process of being rolled out and will be fully functioning by 2018. And they will strengthen the powers of the Pensions Regulator to improve protection for those in occupational pension schemes outside the ambit of NEST. 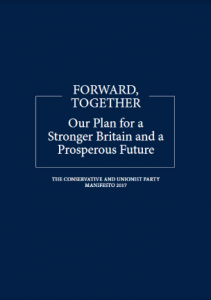 Yet the title of the Conservative manifesto, ‘Forward, together’ is interesting. Better off, older voters are the party’s core constituency, yet there is surprisingly little in the manifesto for them. Could that be connected to emerging inequality between older and younger Britons (see work by the Resolution Foundation)? Although a rapid U-turn was made by May from another manifesto commitment to fund social care via increased contributions from the better off – that original promise may signal an acceptance in No. 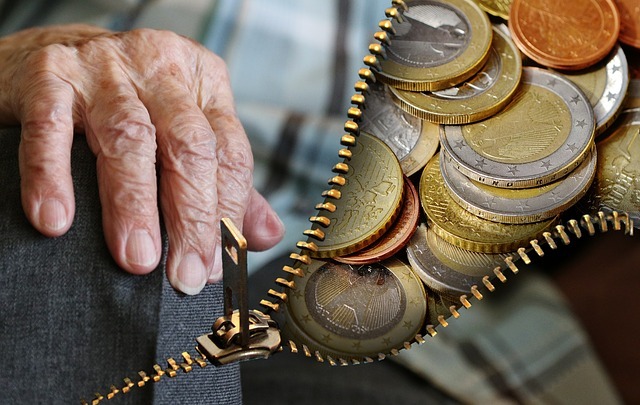 10 that the cost of an ageing society may be unsustainable on present promises without imposing an unacceptable burden on the younger generation. So the absence of promises to pensioners may itself be significant. Compared with previous Conservative general election programmes, the party’s present manifesto has surprisingly little in it for the elderly – that may or may not signal an acceptance that they are going to have to bear a bigger burden of paying for an ageing society. Labour’s manifesto is predicated on the idea that an array of new taxes and the innovative economic policies it proposes to generate higher economic growth will be enough to fund its very long list of spending promises to voters of all ages, including very generous promises on pensions. Neither party’s manifesto, however, appears to see Brexit as anything but easily navigable. That gives these documents a potential air of unreality, interesting as they are as possible harbingers of the parties’ respective ideological futures. The views expressed here are personal views and do not reflect the views of the University of Bristol or the funders of the organisers’ research. This entry was posted in Governance and public services and tagged Conservative manifesto, GE2017, General Election, Labour manifeso, Manifesto, Pension, Retirement by policybristol. Bookmark the permalink.